On An Overgrown Path: Do concert recordings make sound sense? Do concert recordings make sound sense? Regular readers will know that I revere Sir Colin Davis as a national treasure and that I rate the symphonies of Carl Nielsen among the greatest music of the twentieth century. Which means a post about Sir Colin's new CD of Nielsen's Fourth and Fifth Symphonies is going to be a pretty predictable affair - a triumph, youth is a state of mind, essential for every collection etc etc. So, sorry to disappoint. In the first few minutes of auditioniong the LSO Live disc it became clear that all was not well sonically. My listening notes include "one dimensional sound lacking front to back depth, not enough of air around the instruments, muddy bass line, a vieled quality, lack of focus, no real slam" and so on. All of which started me reflecting on whether the current move away from studio to concert recordings makes sound sense. The London Symphony Orchestra is just one of many leading orchestras which market CDs and downloads of their concert performances. Recording a concert as opposed to a studio session has many financial attractions but brings two main challenges. First, with a few exceptions such as Snape Maltings, concert halls make poor recording venues. Which is why the acoustically mediocre Barbican, venue for the LSO Live recording, is rarely if ever used for recording anything other than concert performances. The second challenge for concert recordings is audience noise. 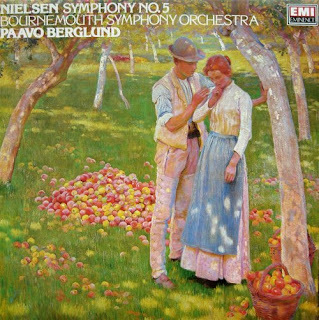 As is usual two performaces of each of the Nielsen symphonies was recorded by LSO Live to allow 'patching': this is the editing out of obtrusive coughs and other noises (including final applause) by replacing the problem passage with a patch from the alternative performance or a rehearsal take. But patching is only of limited use. Which is where the solution known as multi-miking comes in. This involves using more microphones and placing them closer to the performers to capture more music and less ambient noise. Multi-miking has the additional benefit of making the microphones less visually intrusive, which is particularly important if the concert is being video recorded, as are, for example, the BBC Proms. But the benefits of multi-miking come at a sonic cost. In simple terms there is an inverse relationship between the number of microphones and the fidelity of the sound and aural image from the resulting recording. Which is why almost all the great sounding recordings are made with simple microphone arrays. 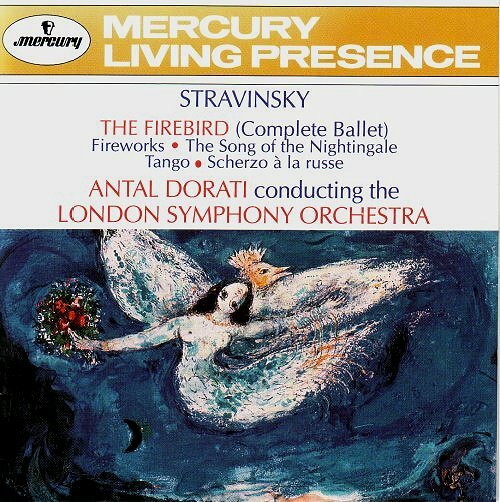 An example is seen below, Antal Dorati's legendary 1959 Firebird with, ironically, the London Symphony Orchestra; this was captured by Mercury using just three microphones. A typical BBC Prom or a relay from the Barbican Hall uses dozens of microphones all over the stage and with more strung together overhead, being mixed into an unnatural anonymous similar-sounding mush coated with a gloss of digital reverberation. There is no problem per se with concert recordings, other than the acoustic limitation of the venue. Many great recordings have been made at concerts. 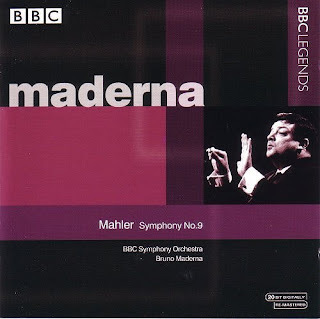 Examples which have featured here include the Richter/Gavrilov Handel Suites made at the Tours Festival in 1979 and Bruno Maderna's now deleted Mahler Nine made in in the Festival Hall in 1972 and seen below. Occasional audience noise leave the listener in no doubt that these are concert performances, but their greatness is not diminished as a result. The problem, as highlighted by Tony Faulkner, is the current fashion of making concert recordings sound like studio sessions by technical legerdemain. There is an almost total absence of extraneous noise on the new generation of concert recordings. When have you heard an audience totally silent at a concert? Very rarely I would bet, which means sonic manipulation is being applied as an additional intermediary layer between performer and listener. And that manipulation has been made a lot easier by recent developments in digital technology. At which point more than one reader will doubtless quite rightly point out that the present meltdown of the classical recording industry means studio recordings are no longer viable in many cases; so if you want a great performance on disc it has to be captured at a concert. So, sorry to disappoint again. I really wanted to love Sir Colin's Nielsen despite the compromised sound, but I just couldn't. For my tastes the opening of the Fourth sounds rushed to the point of being garbled, while, conversely, the Fifth lacks the momentum and muscularity needed to carry this masterpiece forward to its life-affirming conclusion. Now I am well aware that the views of almost every critic present at the Barbican concerts at which the disc was recorded differ from mine. And I am also aware that those critics are musically far better qualified than me. Which leaves two possible explanations as to why I find this new Nielsen release somewhat extinguished. The first is that my taste in Nielsen interpretations is particularly wayward. Which may well be the explanation, because, as regular readers will know, my taste in other things musical is notably wayward. 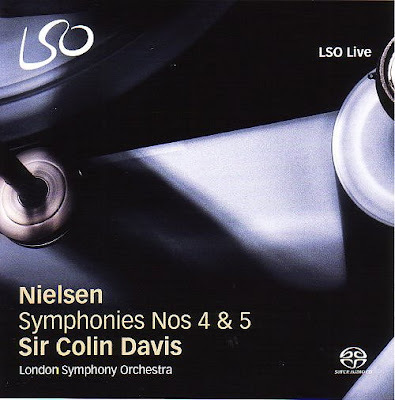 The second explanation is that Sir Colin's highly personal Nielsen interpretations achieve 100% transmission when experienced in the concert hall but lose their efficacy when heard as a less than ideal recording. Which is an appealing explanation, but is rather negated by the emotional power of sonically far more compromised recordings such as Casal's Bach and Karajan's Hänsel und Gretel. To try to better understand my reaction to Sir Colin's interpretation I repeatedly switched between the LSO Live disc and the recording of the same works by Theodore Kuchar and the Janáček Philharmonic Orchestra for Brilliant Classics that I praised here last year. It amazes me to say it, but, for me, Kuchar and his little known Czech orchestra win on virtually every count. The Janáček Philharmonic may not have the refinement of the LSO. But for sound quality and, much more importantly, for sheer ability to communicate Nielsen's visceral and uplifting music they are, for my money, far superior. And, talking of money, at amazon.co.uk Theodore Kuchar's 3 CD cycle of the six Nielsen symphonies sells for £8.99 compared with £5.99 the single LSO Live disc of the Fourth and Fifth Symphonies. There have been a number of other fine recordings of these Nielsen symphonies and in this completely subjective post I am going to highlight a few other personal favourites. Karajan and the Berlin Philharmonic's now deleted Fourth for Deutsche Grammophon shows just how good the German band and its long-time conductor could be given the right repertoire. My acquaintance with the Fifth, which for me is possibly the greatest twentieth century symphony, was made through the 1975 EMI LP seen below on which the Bournemouth Symphony Orchestra is conducted by the grossly under-rated Paavo Berglund. A Google search to see if Berglund's interpretation is still available brings up my 2009 article about it as the first result, so I assume it is long deleted. And my final personal favourite comes from another grossly under-rated conductor, Jascha Horenstein's 1971 recording for the BBC made with the New Philharmonia Orchestra in the Corporation's Maida Vale studio which was released as a commercial disc. This also appears to be unavailable, making it a clean sweep for the deletions and a salutary reminder of just what a sorry mess the record industry is in. I am not a regular purchaser of contemporary concert recordings. So to compare the sound quality I also auditioned LSO Live's 2005 Má Vlast. This features the same conductor, orchestra, production team and hall as the Nielsen disc. The sound on Má Vlast certainly does not match a good Kingsway Hall or Abbey Road Studio 1 recording, but it does have better definition that the Nielsen. Interestingly the Smetana is not an SACD disc whereas the Nielsen is. All my listening is done using the standard CD format as I do not have SACD replay equipment. (Details of my primary replay system here). It would be interesting to find out if there is more life to the sound in the SACD layer of the Nielsen disc. If that is the case it should not be so as Alia Vox and many others deliver superb sound from the Red Book CD layer of SACD hybrid discs. So is it the sonic compromises of concert recording that, for me, partially extinguishes the fire of Sir Colin Davis' Nielsen? Or is the problem simply my wayward musical tastes? Ternary thinking suggests the explanation is a mixture of the two. If any conclusions can be drawn from this post it is that concert recordings are here to stay whether we like it or not, but the production teams making them should withdraw more into the background and let both the music and the audience speak for themselves. But in the final analysis I was glad the new LSO Live disc sent me down this path. As Nielsen himself told us, predictability is the enemy of classical music, and it is also the enemy of this blog. 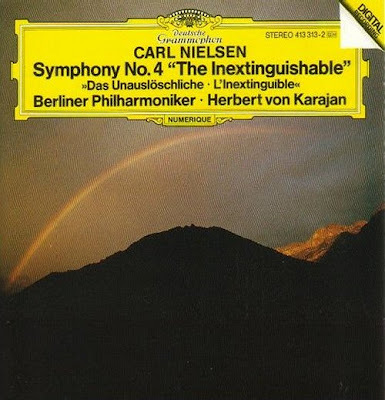 As I pressed the play button to hear this new CD of Carl Nielsen's mighty Fourth and Fifth Symphonies for the first time I already had the glowing post outlined in my head. It does us all good to be proved wrong occasionally. * It is the music not the timings that matter. But the timings do make for an interesting comparison. Sir Colin despatches the first movement of Nielsen's Fourth Symphony in 9' 56" compared with Theodore Kuchar's 11' 08". By contrast the Fifth Symphony to the end of the Adagio takes Sir Colin 20' 57" and Theodore Kupar 18' 21". ** Finally, I was going to comment on the artwork for the LSO Live Nielsen disc. But instead I reproduced the designs for two other discs of the same works above and below. Cut to The art of the album sleeve. My copy of the Smetana IS an SACD hybrid (at the time they were releasing both formats - hybrid and plain CD. today they just release the hybrid and the download). I quite like it, as I do most of the other SACDs I have from the LSO (and yes, I have SACD equipment). I agree there's no reason releases of the same orchestra in the same hall should not get better over time, live or not. This was true of Bernstein's Avery Fisher Hall recordings in the 60s and has also been true of Rattle's recordings with the Berlin Philharmonic (also almost always done live). The only thing I can think of is that they got either new engineers, or new equipment, into the process. It could also make a difference if the 2-track plain CD version was made from mixing the original source mics, or from down-mixing the 5.1 SACD final mix. Because of differing sample rates, the latter would introduce a "lossy" sound much like mp3 compression does. If they got lazy (or cheap), they may have automated that downmix without paying attention to the quality difference - after a while if you don't clear your ears (like cleansing your palate), you hear what you want to hear. Of course, that's all speculation on my part. I find myself largely in agreement - the 4th on the LSO Live disc didn't really grab me either, though I enjoyed the 5th much more. However, from a technical standpoint the disc is one of the poorer ones I've heard from LSO Live recently. Others seem to tame the problematic Barbican acoustic rather better. I'm generally a fan of live recordings, but what we get with LSO Live isn't really live, it's a cheat, since it's a patch of multiple performances rather than a single live event preserved (a with BBC Legends, say). One last point - I'd mention the Halle's label, which has produced some very fine recordings, both technically and artistically, especially Mark Elder's readings of Gerontius and The Kingdom. This blurring of "is it live is it studio" ignores another area of debate; the fundamental artistic difference between the studio and the concert hall. I think a concert recording SHOULD be 'warts and all' with the occasional all too human blemish and appreciative applause. As another commentator wrote - listen to some of the better BBC legends CD's and you hear performances of extraordinary white-heat one off intensity - I'm thinking Svetlanov with the BBC SO here as just one example or Horenstein in Mahler 8 at the RAH. No thought of second takes to cover a split note or intrusive cough. A studio recording by definition has a different dynamic which in its own right has value in that it can allow performers to take technical risks and/or artistic choices and see what works best on play-back - ask Glen Gould. The quasi-studio concert recording seems to me to be neither fish nor fowl. Of course what also needs to be borne in mind is that few orchestras are given the luxury of extended rehearsal for concert or recording. "Rare" or unfamiliar repertoire is almost by definition rehearse/record. Pliable mentions the underated Berglund - an opinion I share absolutely 100%. But talk to ex-Bournemouth players of the 70's and you'll hear that a key to his success (and of course Silvestri who pre-dated him)was extended detailed rehearsal as well as innate musicality. The weasel word of productivity infects the musical scene today. Very fine though the players of the Halle and the RLPO are I suspect that in no small part their perceived success at the moment is because Elder and Petrenko have a stature that allows them to ask for the extra rehearsals they feel they need. Few orchestras let alone conductors have that luxury. With the loss of time comes the loss of individuality both in performance and interpretation - this upping of general technical excellence but leveling out of interpretative variety is the biggest threat to the future of classical music. By the way - I agree apropos Kurchar and the Nielsen Symphonies - full of the fire of discovery, The same combination play the Dvorak Tone Poems very well - also on Brilliant Classics. For my taste the LSO Live series has been one of nearly unrelieved disappointment - a fine orchestra for sure but would anyone say any of that series becomes their reference performance of any work....? Surely not. For my taste the LSO Live series has been one of nearly unrelieved disappointment - a fine orchestra for sure but would anyone say any of that series becomes their reference performance of any work....? Surely not. I agree with Nick. I have several LSO Live recordings in my collection; most were impulse buys and now gather dust on the shelf. I could add that I've had a much better experience with the RCO Live series put out by the Concertgebouw - all sonically impressive, and there are at least a couple that I return to fairly regularly (Haitink's reading of the Mahler 4 and Jansons leading Ein Heldenleben); some others are really disappointing, but I'd like to think that the better recordings in the RCO Live series justify the venture. I sometimes wonder how successful house labels like LSO Live have been in commercial terms. Given that the development costs are lower than they would be for studio recordings, have these labels been profitable for the orchestras that produce them? On the other hand, I also wonder whether thinking in these terms misses the point. Perhaps some of the orchestras that are moving in this direction simply believe that producing new recordings is key to their public image and marketing strategy, regardless of whether or not they make money in the process or whether or not the recordings themselves are worthwhile. For me the problem with so many LSO Live discs is, as mentioned briefly above, over-miking. By spotlighting every last section of the orchestra one renders the overall picture flat and two-dimensional. There's no depth perception. The LSO-Live Mahler cycle suffers greatly for this. Compare the LSOs to the RCO Live recordings, however (Mariss Jansons conducting). The RCOs are so much more natural; clearly less mics were used, and as a result there is more of that natural ambience and more depth to the sonic picture. The orchestra doesn't merely extend to the left and right, but extends back behind the speakers as well (with reference to the two-channel mixes of course). And as with the LSOs, all audience noises during the performances have been purged, but that's okay because the sound is so wonderful, with only the closing applause (sounding, frankly, pasted on) betraying the live source. Equal to - or possibly even better than - the RCO Live Mahler recordings are the Tonhalle, Zurich recordings (RCA label, Zinman conducting). 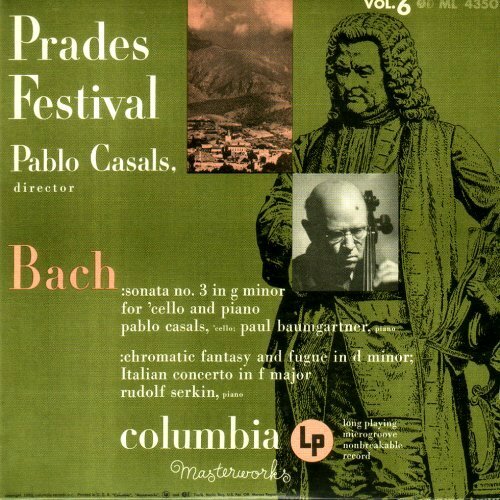 Not "live" as such, but still recorded in a concert hall (literally "Town Hall") these recordings are so gorgeously natural sounding they'll make you re-evaluate what constitutes the "audiophile" tag. So, I think the RCO Live and Tonhalle, Zurich recordings prove that there's nothing inherently wrong with recording a performance live in a hall per se. It just has to be done right. The problem with the LSOs is surely a combination of bad venue (Barbican) and poor engineering with way too many mics. Incidentally, all my comparisons have been with SACDs and hi-res downloads.